Google, Facebook, Pixar and Etsy all have it. The incredible office layout and the fun work interior design. With the explosion of new businesses, office interior design is becoming a more serious considered element of business success. Wondering how to create a great office interior design? Here are our 6 best office interior designer tips to help you, and your employees love the office you’re in regardless if you’re looking for startup design or commercial office design help. Contemporary office interior design by Decorilla interior designer, Rosela B. 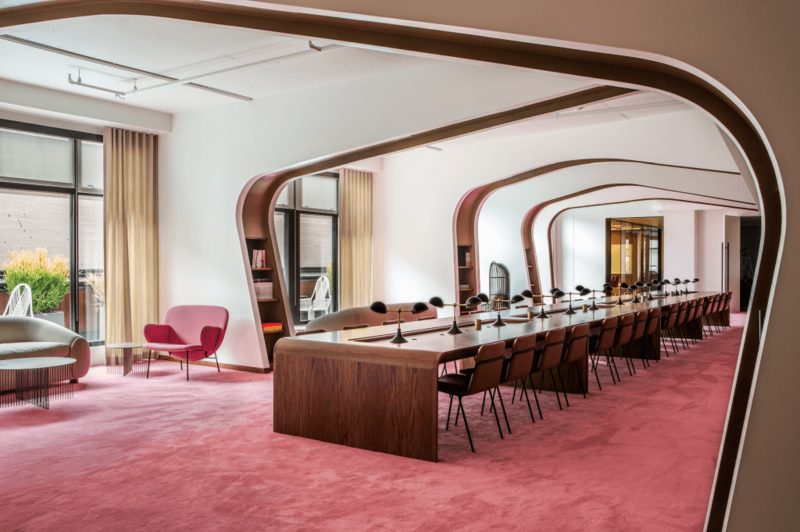 Just like with residential design, the soul of commercial office design comes from the style it exudes. Consider the goal and mission of your company and mirror that in your office interior design. 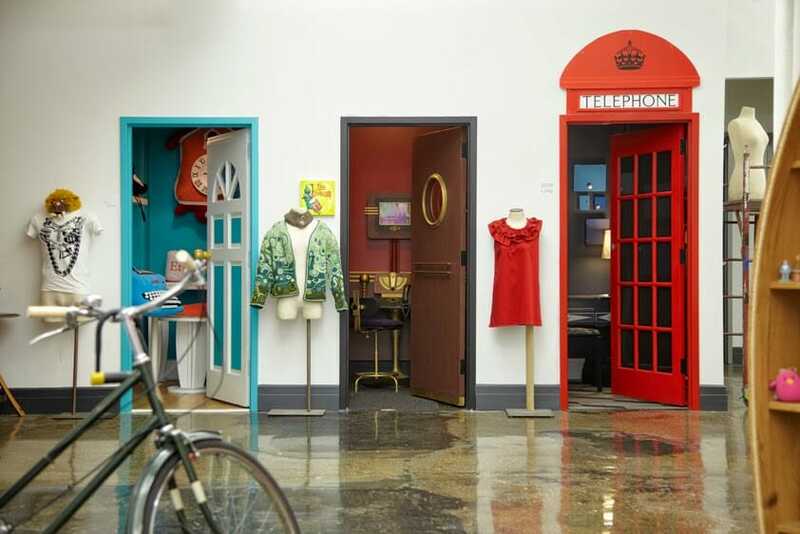 The Etsy Dumbo office, for example, translates the eclectic and playful nature of it’s site into bright colors and a cozy, hand-crafted feel. 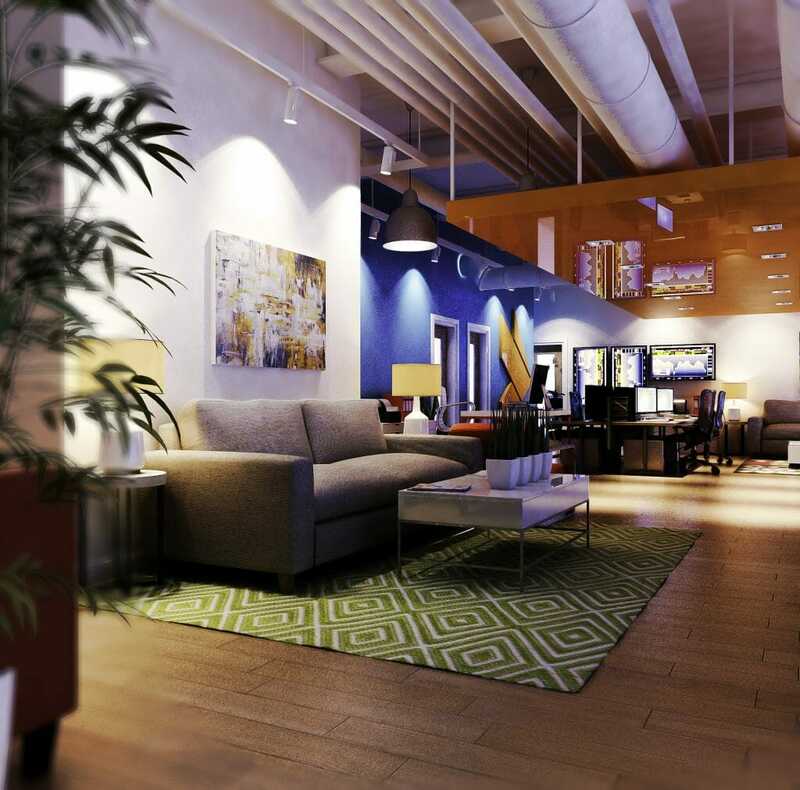 Austin’s Homeaway Office takes its purpose literally by simulating a vacation while at work! If pinning down a style is challenging, the expertise of an office interior designer can help. In a recent California startup office project, the client expressed wanting to make the loft style unit “modern looking with the right accents.” With exposed ceilings offering an urban feel, he was looking for a “trendy modern look that matches (their) business of Internet Marketing.” With this information Decorilla office interior designers did just that. Kitchen area office design by Decorilla interior designer, Mladen C.
More and more people are working remotely from the comfort of their own homes. With the hours put into work, creating a comfortable environment much like home is something to consider. To start, select the right pieces of office furniture that offers varied postures for comfortable work. Whether it is an ergonomic office chair, a plush sofas with ottomans to kick up your feet, giving employees options of where to work makes a difference in work efficiency. 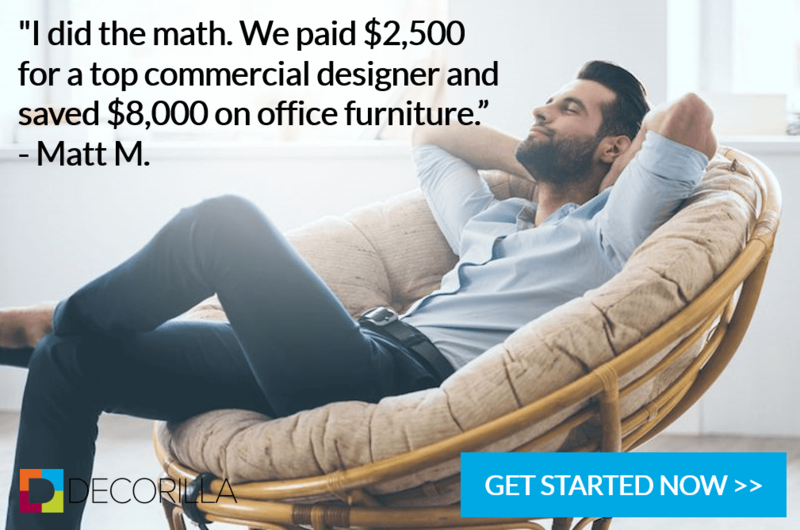 Wayfair, West Elm, and Herman Miller are some furniture vendor that carry commercial grade furniture with many office decor possibilities. 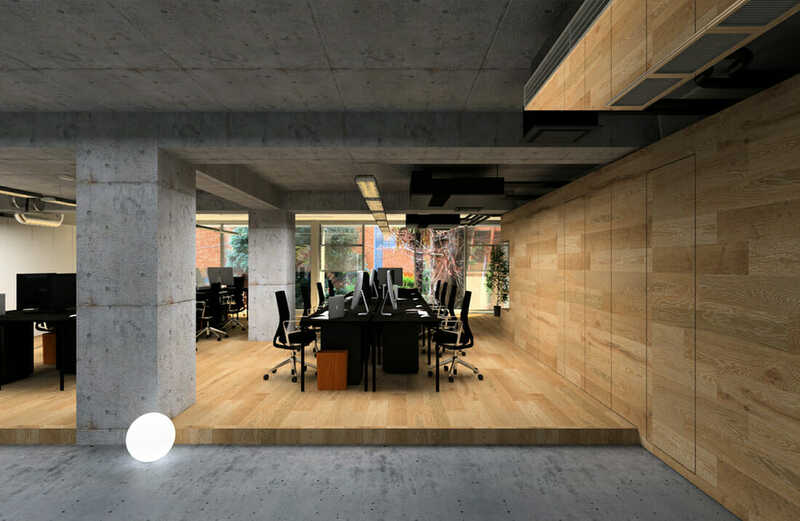 Office design and layout concept by Decorilla office interior designer, Mladen C.
Apart from ergonomic furniture, lighting also has a huge role when it comes to office interior design. One light definitely does not fit all. To increase productivity, bright, white lights help simulate daylight which makes us feel more awake and focused. On the contrary it’s important to think about times of relaxation in big and small office interior design as well. Staring at a computer screen (like most of us do on a daily basis) can cause fatigue, so don’t forget about dim task lighting to help give they eye a break from the brightness. 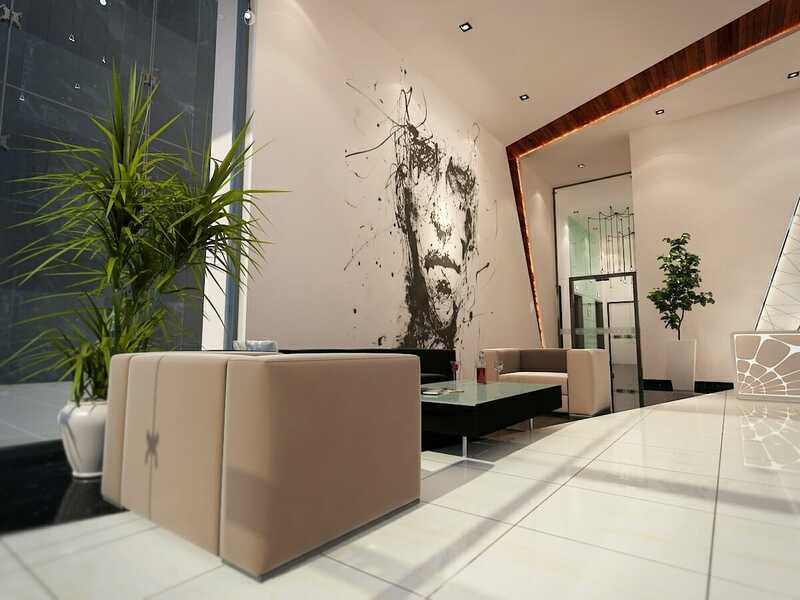 Creative office lobby design by Decorilla office interior designer, Haitham D.
The mood of an office design is highly influential through design choices. Through color psychology we know that different hues have the power to evoke energy, conversation, and happiness. Selecting a cool blue or green for a lounge area encourages relaxation, while a space that has red or yellow is best for meeting rooms where ideas are being generated. 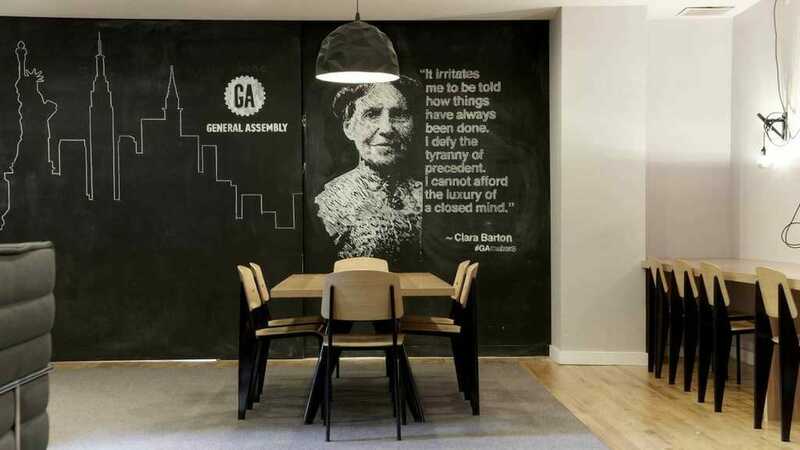 Other elements like custom art with inspirational quotes or an homage to the city are other ways to maintain good morale and in turn, happy employees. We are in an age where people like to be alone together. Creating pod like work spaces is something that has taken off drastically in recent years. 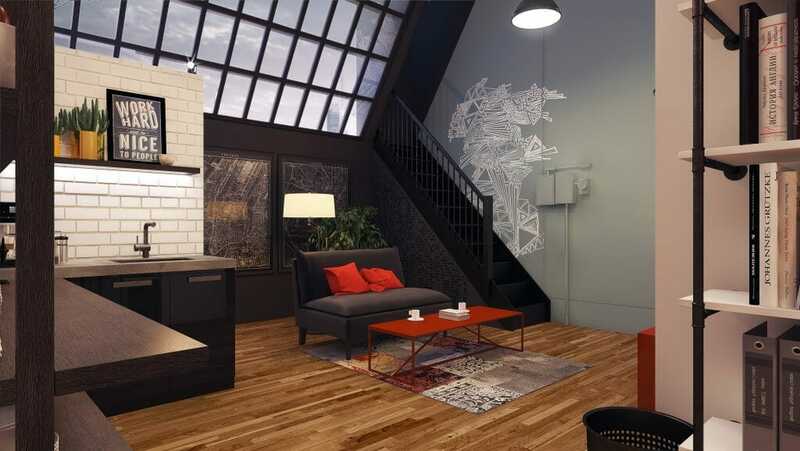 Gone are the days of a closed in blah cubicle, welcome the new trend of color, open concepts, and togetherness. Having multiple areas where one can work increases creativity and productivity. After all, who doesn’t love a change of scenery every once in a while? Office design for sitting area by Decorilla office interior designer, Roberto D.
Most businesses thrive on opportunities for collaboration and the meeting of ideas. A good office interior designer makes that possible by creating intentional zones where small or large groups can gather. This is where a smart spatial layout is needed. 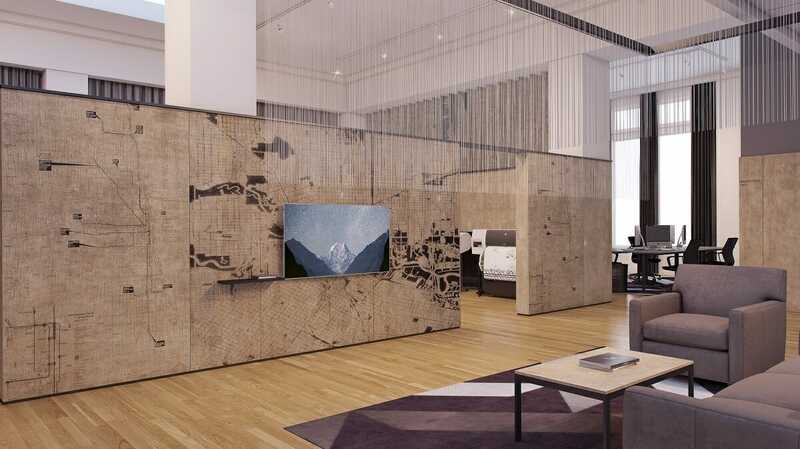 Writable walls, round meeting tables, and cork board panels to pin ideas are some ways to do this. Open concept startup office interior design by Decorilla designer, Alicja S.
Office interior design services and the furniture industry have come so far from your average stuffy conference room. Try adding in some movable furniture! For example, small tables that can be combined to once large table, a hanging chair, pieces that will make you excited to gather with your fellow employees and collaborate together. When we’re stagnant, so are our brains! Modern small office interior design 3D rendering by Decorilla interior designer, Aldrin C.
Office layout is possibly the most important part of design in commercial interior design projects. Whether we’re talking about a small company size of under ten employees or one that is a couple hundred and growing, being mindful of how space best promotes productivity is key. Modern small office design and layout by Decorilla office interior designer, Aldrin C.
Recent research has found that “giving employees input into the interior design of their workspace can improve productivity by as much as 32 percent. Any positive changes can improve productivity by up to 17 percent,” according to Business2Community.com. 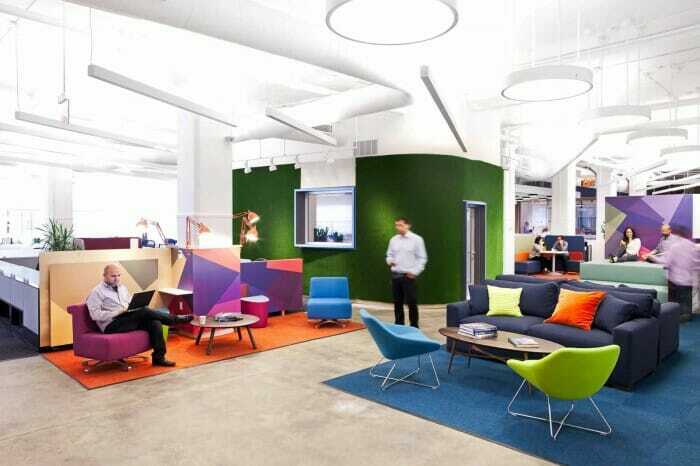 This offers proof to the theory that creative office spaces lead to positive performance of employees. While quiet areas for concentrated work are essential. So is offering engaging areas in the workspace. A ping-pong table, bean bags, even a slide, can be unique forms of stimulating productivity. Looking to design your office on an affordable budget? 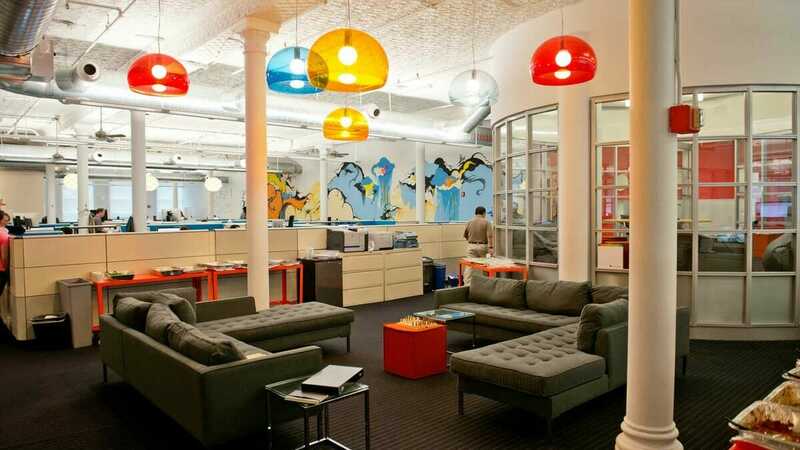 Check out these money saving tips to get the stylish and effective office space design desired. Ever heard the saying “you never get a second chance to make a first impression”? Well, that couldn’t ring more true when it comes to commercial office interior design. 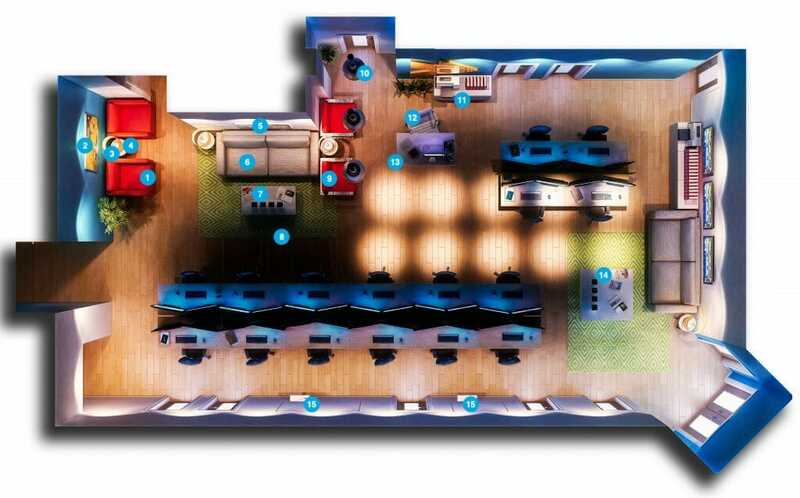 Having a well designed reception/lobby area can make or break the overall office mood. Have a friend meeting you for lunch? They’ll enjoy waiting in a well designed space. Have an important meeting with a client? They’ll take you more seriously if they’re in a well designed environment. Contemporary office reception design by Decorilla office interior designer, Mladen C.
Reception areas are a great place to go big. Add in the feature wall you’ve been swooning over, have the most comfortable furniture so your guests feel immediately at home, we bet you won’t hear anyone say we wish your reception area was less inviting. You’d be surprised how the first impression of a great office design can actually increase business as well. 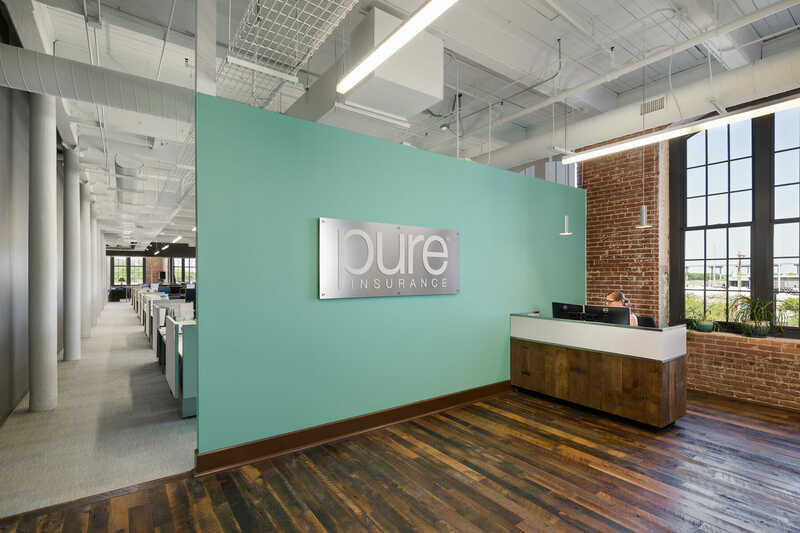 There’s no doubt that the traditional design of an office space has long evolved from rigidly lined cubicles and cold overhead lighting. The modern office interior design caters to the flexible office schedule and engaging startup and business challenges. With these tips to consider, an efficient and pleasing office design can be created. 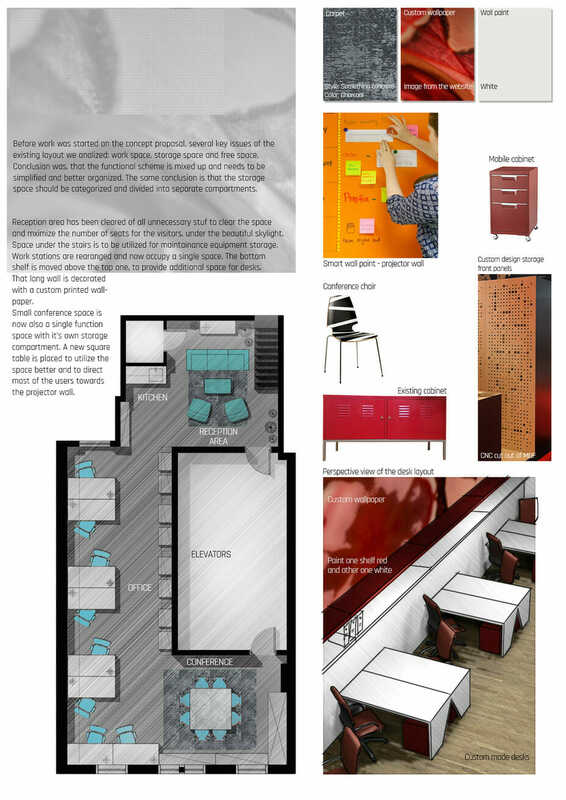 Have an office design that needs designing? Schedule a FREE design consultation today to see how you can get a functional and beautiful design that everyone will love and save money too!